You may have gathered in Part I that I believe if appropriate community services were in place and people were integrated into the community, communities will be enriched. In addition, the public might be less likely to immediately jump to the conclusion that a person who commits gun violence is a person with a mental health condition. Back in June of this year, I had the privilege to attend the national conference of disability rights. I saw leaders of many devalued groups plead for real life examples of people experiencing breakdowns in the system. Bureaucracies tend not to advertise these stories, because, I believe, policymakers favor distance as they make life and death decisions for those less fortunate. Our very own PAIMI Advisory Council* members have been interviewing folks in residential facilities, asking questions to focus on their strengths, their hopes and dreams. They have found inspiration and information that could lead to dramatic, positive changes if The Olmstead Decision continues to provide a model of how people could be included in their communities. “Roger” is a person with a mental health condition that is debilitating to him in his current environment. Despite the residential rule that he doesn’t get lunch if he doesn’t take part in some kind of activity outside of the residence (like “Kiddy Day Care”, as it is NOT affectionately called by many), he stays in his room, primarily because he is so tired. His roommate, “Toby”, who is new to this residential facility, says that Roger probably needs to talk to his physician about the side effects of the medication he takes because he “passes out” and sleeps a lot of the day. Toby, on the other hand, appears to be motivated emotionally, mentally and physically. He is complimentary to the owners of the facility he lives in because they helped him become eligible for Medicaid. However, he is puzzled by the amount of money he pays in room and board. The food he receives has not been what a typical Nebraskan would consider “good” and he has resorted to visiting a soup kitchen for the homeless to get balanced, healthy meals. He is concerned that he never receives any spending money (required by Medicaid rules) and his “employment” is more like volunteer work because he does not receive a check. Toby is frustrated that when he has complained he sees no changes take place, yet he feels like he is punished when he does speak up. Therefore, he has adopted the “you get more with sugar” attitude and has stopped complaining. 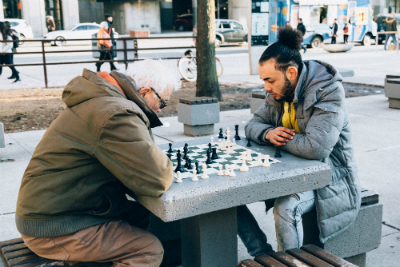 He has the insight that his diagnosis puts people off, but remains optimistic that someday he will gain some friends with like interests (he enjoys a good game of chess, for example) to pal around with. His goals are to live and work in a richer environment and to have a few friends to spend his free time with. However, he believes he can only succeed by moving to another state with a better mental health system in place. 1. There will always be a need to offer meals to people who are homeless and / or indigent. But life skills will never be taught by giving someone a meal. In the not so distant past, there has been programming at residential facilities in Lincoln, Nebraska that have taught life skills in “real life” environments, but programming was terminated because of political decisions that were portrayed as “budget restraints” (restraints that were, in fact, “the emperor’s new clothes”). 2. Residential facilities that rely on Medicaid money will likely be ripe for corruption and greed; even the well-intentioned will inevitably hamstring individual creativity and growth. On the other hand, simple additions, like a resident given the means to paint her own room the color of her choice, can help create a more home-like atmosphere. 3. People who are disenfranchised need an advocate to maneuver through the labyrinth of the medication/physician’s world. 4. Isolated enclaves - sometimes owned by the same individual - where residents are employed or have a day program at the same place, are still institutional in nature. They impair choice of activity and autonomy of the individuals and the programming is often not even age-appropriate. It is used to “fill time,” and/or certainly not designed to maximize independence (socially, interpersonally and economically). 5. Laws must be enforced and those who have the power and authority need to be outraged by the current conditions. 6. There must be available staff who are properly trained and readily available who can help individuals access all services available to the general public, including competitive employment in integrated settings. And there must be opportunities for interactions with individuals who are not paid to interact with them. 7. Transportation must be available to access activity and lifestyle choices, e.g. fitness facilities, community centers, recreation centers, libraries, community colleges, religious centers, etc. 8. Partnerships are good and can be effective at providing greater access to the good things in life. In optimum conditions and with optimum health, people live out their lives in fulfilling ways. The path may be tough but hardships need not be insurmountable barriers. In fact, if we all facilitate growth and see the diversities as strengths, we will all benefit. And that will truly be something to celebrate. *The Protection and Advocacy for Individuals with Mental Illness (PAIMI) Advisory Council advises the Disability Rights Nebraska Board of Directors on policies and priorities to be carried out to protect and advocate for the rights of individuals with mental illness in Nebraska and on remedies to enforce those rights.